This IBM® Redpaper™ publication is different from others you have read because it was not written in the conventional way with a residency and a handful of authors. It was written by people who want to make a difference. 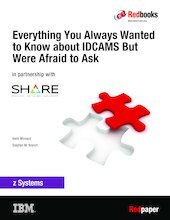 The IBM Redbooks® organization and SHARE teamed up to give all of the attendees at the SHARE 2016 conference that was held in Atlanta, US, July 31 - August 5 the opportunity to contribute their thoughts and ideas about the latest IDCAMS capabilities. Attendees were invited to contribute their thoughts and ideas. Many discussions arose on the subject and related techniques. The “Everything You Wanted To Know About IDCAMS But Were Afraid To Ask” session that was held on Wednesday at 8:30 AM. Techtalk sessions at the SHARE booth. Discussions that were held at the SHARE booth Influence area. Chapter 1, “Live at SHARE: Innovation through collaboration” on page 1, describes how the event went from idea to completion. Chapter 2, “Introduction to IDCAMS” on page 5, presents a basic overview of IDCAMS. Chapter 3, “Your mission” on page 13, guides you through a provisioning scenario that uses IDCAMS. On behalf of everyone who took part in this project, we hope you enjoy the collective thoughts of many people who were so willing to help to increase your expertise.